A goal is a desired result that a person or a system visualizes or imagines as a future possibility, plans and then commits to achieving that desired result as set previously. The setting of goals or targets is extremely necessary to move on properly and efficiently in life. Both the setting of the goal and working dedicatedly to implement those are equally important. Following the correct path for the achievement of the goal or target is of utmost importance rather than setting the goal and not following the right path to achieve it. The reasons why setting a goal is important are as mentioned below. 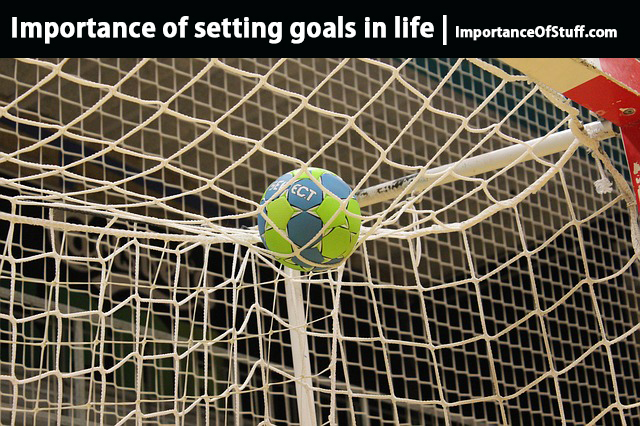 Goals help to provide focus – A life without a goal is simply like an arrow without a target. One can shoot the arrow anywhere one likes. Without a goal, it becomes tough to achieve anything until and unless there is something to focus on. One might have a huge potential and great talent, but without focus, the talent and abilities are simply useless. Hence, the focus is an important thing that setting of goals provides us with and with its help we are able to achieve something in life. The sense of direction is actually what enables the mind to focus on a goal and go on a path to achieve the goal instead of aimlessly going around for nothing. With a goal in mind, we know exactly what all things to do for attaining the goal. Goals help to measure the progress – By the setting of the goals for oneself, one can keep track of one’s progress. With the help of these aims, one can set a benchmark for the performance of self and then one can compare how high or how low the performance is as compared to the level that is set. It can also be very well understood that how good or how bad one has performed in comparison to the previous performance. Thus, the goals are a very good way to measure one’s performance and then do the needful accordingly. Goals help to create accountability – Having a goal in mind makes one accountable, and most importantly this accountability is only for the purpose of self. No one has any idea about the goals that have been set, and no one stands to gain if the goals are achieved. These goals solely help to create accountability of self, and by the setting of some specific goals, one can easily understand that if one is on the right track or not and if not then what needs to be done to be right back on track. Goals keep us locked in and uninstructed – The setting of goals gives us the feeling of mental boundaries or limits that we are supposed to stay within. When one has an endpoint in mind, one automatically stays away from various distractions and stay focused towards the goal. Hence, the goals play a decisive role in preventing any hindrances or obstacles in the path of achieving the goal. Goals help to take control of life – Goals are critical to take control of one’s life rather than allowing life to take control of oneself. There are several people who work extremely hard but are unable to achieve anything ultimately because they are just working because they need to work and are going in the direction where life is taking them. The goals will show them the direction and the target to achieve by working hard. Thus, the goals will eventually help them to take control of their life where they exactly know what they are working for. Goals help to give motivation – Goals are the roots of motivation and inspiration. Without motivation, it becomes tough to achieve or get something in life. The setting of the goals provides one with the foundation for one’s drive. The goals provide a concrete endpoint to aim at and achieve the target with full of excitement. The goal helps one to put a hundred percent effort to achieve the target, and this focus is what results in the development of motivation. Goals help one to be the best what one can be – The goals help to get the best out of ourselves. It helps us to achieve to the highest of our potential. The goals help us to stretch beyond our normal self and attain new heights. The goals are the best way to get the best out of life and show us what we are capable of achieving.